PH Artichoke. Silver Mountain Senzoku Gakuen College of Music. 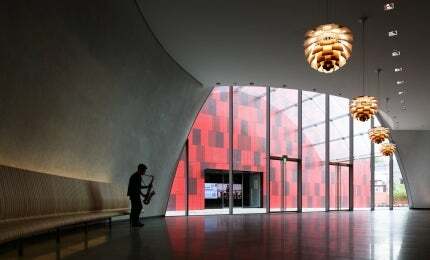 Louis Poulsen is an international manufacturer of high-quality indoor and outdoor light fixtures. Through decades of close cooperation with top architects and designers, the company has become a world-leader in architectural lighting solutions for private and public use. Simplicity is at the heart of Louis Poulsen’s product philosophy. Every product element that the company designs has a light-related purpose, resulting in fixtures that are very simple and discreet, ideally suited to all types of architecture and cultural styles. Louis Poulsen provides timeless lighting solutions that deliver contemporary comfort, year after year. More than 60% of its product range originated as solutions to specific projects and needs. Collaborative partnerships with internationally renowned architects, engineers and lighting designers on projects such as London’s Tate Gallery, Copenhagen’s Opera House, and the Silver Mountain, Senzoku Gakuen College of Music in Kawasaki, Japan, have cemented the company as a world leader in customised lighting solutions. Few lighting companies have inspired as many people as Louis Poulsen. The company continues to combine lighting comfort with original design to create distinct and memorable lighting solutions that complement its superior range of iconic fixtures. Two of its best-known fixtures, the PH Artichoke and the Albertslund Post, have recently celebrated their fiftieth anniversary, and continue to sell in large numbers worldwide. Louis Poulsen relishes change, and sees it as a new opportunity to apply our timeless approach in a fresh context. This is reflected in two of the company’s newest products, the Silverback and the LP Circle. The Silverback family features a wall, ceiling and a pendant, while the LP Circle family is an example of down-lighting, with a unique twist. Both fixtures are based on a sound product philosophy, and the capacity and enthusiasm to rethink the use of light. Designed by the KiBiSi group, the Silverback is a circular fixture with a soft harmonic shape that brings together an opal white diffuser with a silver-shaded metallised back, mirroring the fixture’s colour and texture, and inventing a new way for a lighting fixture to morph into the materials, colours and atmosphere of a room. The LP Circle is based on a customised product designed for a new school in the Ørestad suburb of Copenhagen. The fixture comes in four varieties and features an opal-finished diffuser and a powder-coated aluminium trim ring, available in a wide range of colours. Louis Poulsen’s approach to architectural development began with its collaboration with the renowned lighting designer Poul Henningsen. Together, they created a lighting philosophy that can be summed up in three words; function, comfort, and ambiance, known as the FCA™. This philosophy continues to form the basis for Louis Poulsen’s elegant, functional product designs, that promote well-being in artificially illuminated settings. In January 2012, it was confirmed that the Design Museum in London, UK, would be moved from its current Thames riverside South Bank location near Tower Bridge to a new place in Kensington.